German composer of music; born at Leipsic May 22, 1813; died at Venice Feb. 13, 1883. He commenced the study of music at the University of Leipsic, but had a struggling existence till 1839, when he made the acquaintance of Meyerbeer, who assisted him in his attempts to have his operas produced in Paris. He came in contact also with Heine, who helped him with the libretto of "Der Fliegende Holländer." After much wandering he settled at Zurich in 1849, and there wrote an article, "Das Judenthum in der Musik," which appeared in the "Neue Zeitschrift" over the pen-name "K. Freigedenk." The article did not at first attract much attention, except a protest from eleven masters of the Leipsic Conservatorium to Brendel, the editor of the "Zeitschrift." Wagner protested against the tendency of music by Jewish composers like Mendelssohn and Meyerbeer to be sweet and tinkling without depth. In his "Oper und Drama" (1852) he makes the same protest against Meyerbeer. 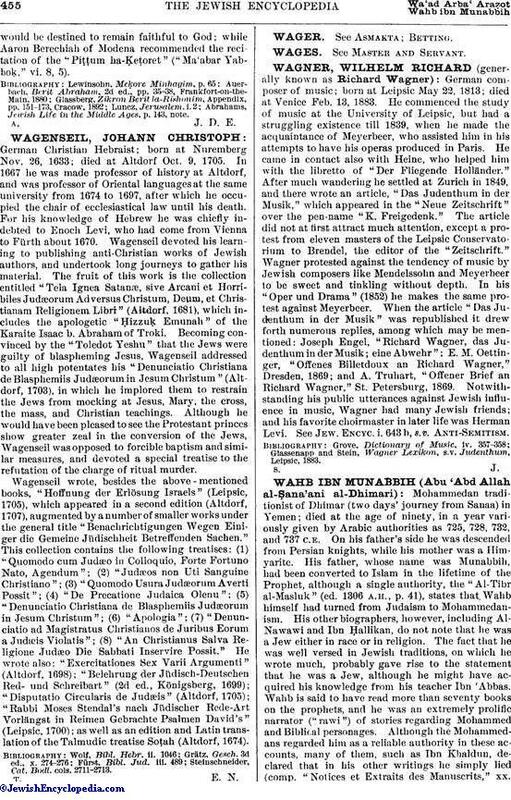 When the article "Das Judenthum in der Musik" was republished it drew forth numerous replies, among which may be mentioned: Joseph Engel, "Richard Wagner, das Judenthum in der Musik; eine Abwehr"; E. M. Oettinger, "Offenes Billetdoux an Richard Wagner," Dresden, 1869; and A. Truhart, "Offener Brief an Richard Wagner," St. Petersburg, 1869. Notwithstanding his public utterances against Jewish influence in music, Wagner had many Jewish friends; and his favorite choirmaster in later life was Herman Levi. See Jew. Encyc. i. 643 b, s.v. Anti-Semitism. Glassenapp and Stein, Wagner Lexikon, s.v. Judenthum, Leipsic, 1883.